This is the Yin Yang symbol. It was developed over 2000 years ago in China by followers of the Tao, a philosophy for leading a richer more meaningful life. It was probably originally created as a teaching tool, and that’s how I will use it here, because this isn’t just some symbol of some foreign religion, but something we can learn from today in order to bring greater balance and understanding to our own lives. First let’s talk about what we see when we look at this image. It is a circle and this is important. It is the circle of life, whole and complete unto itself. Then within that circle are two swirls, one black, one white. The black one is called Yin and it represents energies that are passive, weak, receptive, soft and dark. The white one is called Yang and it represents energies that are active, strong, hard and bright. Yin is considered feminine and Yang is considered masculine. This may cause a bit of consternation, because as a woman, I can tell you I don’t feel passive or weak, and I’m not very receptive to the idea of feminine being associated with those words! But wait a minute, this isn’t about gender. This is about energies. If this were being developed today, they would probably choose to talk about the hormones estrogen and testosterone rather than feminine and masculine. Because all of us, men and women, know what it feels like to have testosterone coursing through us. We feel strong and able, ready to accomplish whatever we put our minds to. And maybe sometimes we feel it as anger, frustration, even an urge to be violent. Likewise, we all know what it feels like when estrogen flows through us. Perhaps we tear up with empathy at a movie. We feel a sense of connection with others and the world around us, we feel open and curious. But perhaps at times we might feel vulnerable, sad and weepy. So we understand that women are not all Yin and men are not all Yang, that we all feel the effects of both these hormones to varying degrees throughout our lives. Our awareness of these energies helps us to bring them into balance and become more skillful. Chinese medicine and martial arts are all about this balancing of the yin and yang within us. 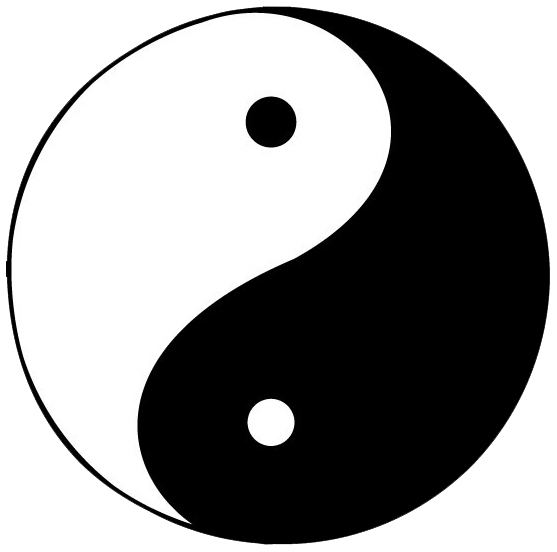 So this symbol of the Yin and the Yang is about opposites. We know a lot about opposites in our culture. When presented with opposites, we are geared to take sides, to choose one over the other. We root for teams, we get caught up in limiting ourselves to either/or decisions, and we define ourselves by our preferences. We might say, “I like summer better than winter.” By locking ourselves into choosing, we lock ourselves out of appreciating the fullness, the entirety of this earthly life. We doom ourselves to being dissatisfied at least part of the time. But doesn’t the Yin Yang symbol confirm this point of view? When you really look at this symbol you notice that there is more to it than just two swirls. Within each swirl is a small circle of the opposite. This is not just an artistic decision to make a pretty design. This is the real message within the Yin Yang symbol. 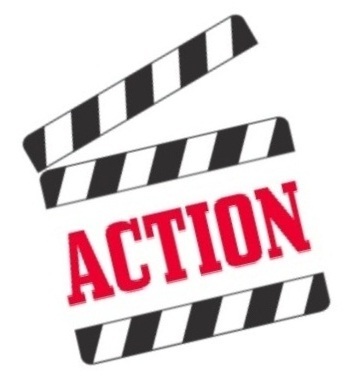 When you look at the symbol, think of it not as a static image but as one frame in a continuous loop of the movie of life. A few frames beyond this one we are looking at, you would see that the little white circle and the little black circle are growing. In each subsequent frame they each grow and grow until the black swirl becomes white and the white swirl becomes black, and then small dots of the opposite emerge within them, and so forth and so on in an endless fluid motion. The Yin and the Yang are continuously merging and separating and merging again. I mentioned that this was the movie of life. Yes! Look around you! Here we are in the middle of the day in the middle of summer. In twelve hours it will be in the middle of the night. In six months it will be the middle of winter. But night doesn’t suddenly appear. It makes its coming known, just like the growing dark dot within the white swirl. We feel it in our own bodies that are a little more tired than they were this morning, and in the slant of the sun and the shadows cast. Likewise, even in the middle of this hot dry season, the cool wet season makes itself known. The rolling hills covered with dry grasses call out to the coming rains. We feel the changes as they come, if we are paying attention. And so it is within ourselves. If we are paying attention, really noticing our experience, we notice the growing of the opposite within ourselves, and within our current situation. How does this serve us? Well, say we are in an unhappy situation, things are going badly, we aren’t well or we have suffered a terrible loss. How great is it to become aware that within this very situation, there is a seed of change, a kernel of hope, a light at the end of the tunnel? “This too shall pass,” is an expression that the Yin Yang symbol embraces. Yes, but what about when we’re in a good place, in a good relationship for example. Why would we ever want to think about it changing, of losing our loved one? Well, we all know the truth already. Whether we are conscious of it or not, we all know that life is temporal, that we will all die, that nothing stays the same. That change is the only constant. It’s just the way it is. No point in kidding ourselves about it. Brutal? Well, maybe. But when we allow that potential for change to be a small but acknowledged part of our experience, we are able to fully be present for the joy of our lives. We are able to really appreciate our loved ones rather than take them for granted. We can open to our experience, savor it for what it is, and stay present for the ways in which it changes. This is why the Yin Yang symbol is valuable to us today. When we see it, maybe on jewelry, a poster or flag, we can take a moment to reflect on its message for us, and open fully to the ever-changing nature of this temporal life. And we can also expand our awareness beyond this small circle that represents our earthly experience, beyond the dance of opposites merging and separating, and rest in infinite spaciousness, in the oneness of all that is. If you are interested in learning more about the Tao, I highly recommend the very accessible book the Tao de Ching, which is available in many English translations. This entry was posted in change, duality, http://schemas.google.com/blogger/2008/kind#post, Tao, yin yang on July 29, 2009 by Stephanie Noble. Pausing in our ongoing exploration of the Noble Eightfold Path, I would like to simply be present for this moment when such strong (and mostly jubilant) emotion is being felt throughout the world. I want to send metta (loving kindness blessings) to President Obama, his family and his administration. May they be safe and free from harm. May they be happy. May they know peace in their hearts. These are blessings we wish for every being. For the newly elected leader of a nation I add: May you stay fully in touch with your deepest wisdom. May Right View be the foundation of your every decision. May you be fully present to hear and understand the needs of the people, the planet and the times. May you find peace within yourself and spread that peace throughout the world. Beyond sending metta, I want to bring full awareness to this moment. First, I want to express gratitude for the skillful means with which every four to eight years our government manages the peaceful, sometimes even cordial, transition of power. All the pomp and circumstance that surrounds this transition helps to ensure the understanding of the importance of this emblematic moment. Every moment is a moment of transition. Every moment in our lives has the potential to be pivotal. But some moments are the pivotal points in the lives of all beings on our planet at the same time, whether they are aware of it or not. And January 20, 2009 a few minutes after noon EST was one of those. The ramifications of this shift of such a powerful government from operating out of fear to operating out of love, hope and openness are huge. None of us know what the future will hold, whether the promise will bring hoped for results, but the potential is certainly there for positive change. President Obama has been clear all along that he cannot save the world. He can only inspire us to do so. His greatest gift is his ability to empower us to be the change we want to see in the world. The ‘Obama Era’ is one of service. Each of us in our own way has the opportunity to enrich our own lives and the lives of others by spending some of our time volunteering. It’s up to each of us to look into ourselves to find what it is we would most like to offer. If you are interesting in finding opportunities in your area, go to http://www.volunteersolutions.org/ . While I have been volunteering for a number of years, for some reason this call to service reminds me more of my father than myself. He had a prestigious career in arts administration as Director of the San Francisco Museum of Art and President of the Philadelphia College of Art, and none of us were surprised when he retired and got out his oil paints and brushes and set up an easel in the spare room. We would not have been surprised if he had volunteered to teach art in the community. But we couldn’t help but be a little surprised that he signed up to be a bus boy at the local free dining room. That volunteer job brought him so much joy. He truly loved the people he served and missed them when his health no longer permitted him to be of service. Years after his death, I still enjoy trying to imagine him busing tables in the St. Vincent de Paul Dining Room in San Rafael, CA. In the scope of his whole life, it was a very small part, but it’s the part that shines the brightest all these many years out. This entry was posted in change, inauguration, metta, Obama, service, volunteer on January 21, 2009 by Stephanie Noble.